“Women in Leadership: Opportunities and Challenges from the Athletic Field to the Boardroom” was hosted by the Carey Business School on February 26. 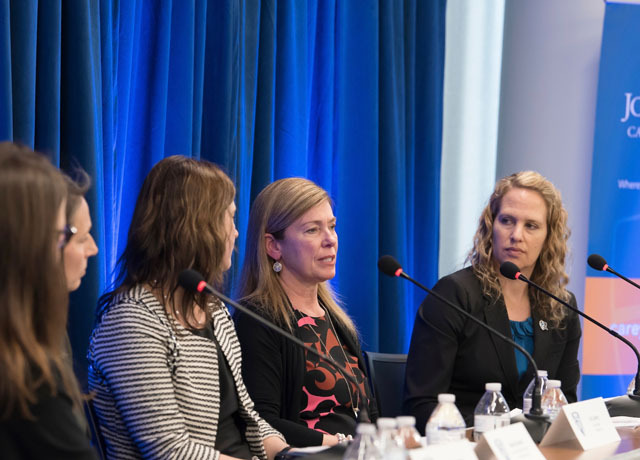 This panel and networking reception brought together a diverse group of four regional women leaders to discuss how athletics and sports have contributed to their development as both leaders and executives. Research suggests that athletics can have a profound effect on shaping and nurturing leadership skills in women. After impactful presentations by each of the panelists, an insightful group discussion on athletics and leadership ensued, supplemented with questions from the audience. Participants in the panel discussion were Alanna Shanahan, director of Athletics and Recreation, Johns Hopkins University; Beth Hehir, vice president, Bank of America; Jennifer Baker, senior associate athletics director, Johns Hopkins University; and Kris Caverly, vice president, T. Rowe Price. The event was moderated by Colleen Stuart, assistant professor, Johns Hopkins Carey Business School. Among the themes discussed was the common denominator of teamwork in sports and business. “Sports requires you to put your faith in a coach and other people, and achieve things as a group,” said Baker, a Naval Academy graduate, and pilot who majored in aerospace engineering. “It requires you to face failure head-on and come back and attack it the next day. The event was part of a series of lectures at the Carey Business School dedicated to unlocking the leadership potential of women and to prepare them for leadership roles in the business world.